CheckUP has over ten years experience working at the interface of general practice and hospital services, with a proven track record in supporting networks to achieve system improvement outcomes. 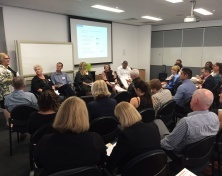 CheckUP currently coordinates the Queensland General Practice Liaison Officer (GPLO) Network, providing a platform for members to share ideas, learnings and problem solve barriers to support improvements at the local level. The Queensland Government’s investment to expand the GPLO Network across 20 hospitals in 2012 was significant, and CheckUP is committed to building upon current experience and networks to support the government to maximise their investment and achieve successful outcomes across Queensland. CheckUP currently has a three year contract (2016-2019) to support the Queensland Health GPLO Network across 4 main areas (see Program Objectives). For more information about the GPLO Network please contact David Millichap, Business Lead on 07 3105 8323.